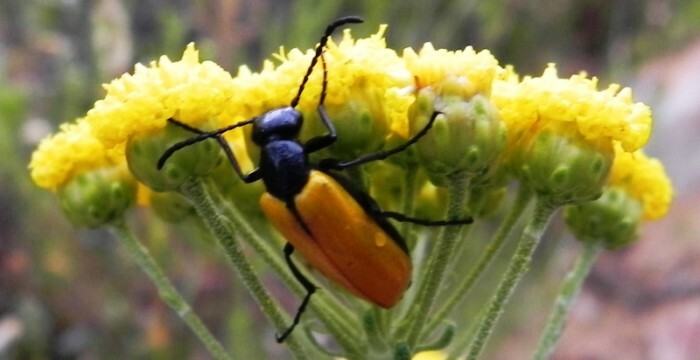 There are over 750.000 species of insects identified in the world. However, conservative estimates put the number of undiscovered species at a further 3,5 million. Insects have been able to take advantage of virtually all habitats from the North- to the South Pole, from lush sweltering forests to the most arid deserts, from fresh water to sea water, and in pools of naturally occurring petroleum. The variety of macro- and micro habitats means there could be a few thousand species of insects in the reserve. Grasshoppers are often erroneously referred to as locusts. The difference between grasshoppers and locusts is that grasshoppers are usually solitary or found in numbers varying between twenty and a few hundred moving relatively short distances, whereas locusts swarm in their millions over hundreds of kilometres. There are at least three species of spectacularly coloured large grasshoppers to be seen in the reserve. 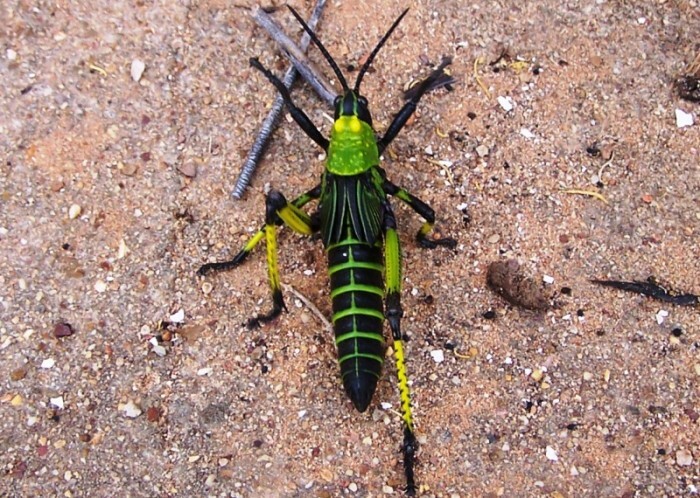 The most common of these grasshoppers, seen in December/January, has a brilliant red thorax and an abdomen of yellow and black. It is commonly known as the Milkweed ‘locust’. The remarkably bright colours are known as aposematic colours, which serve as a warning to predators that the insect is distasteful, poisonous, dangerous, or all three! The other two species that live on bushes and herbs are the black- and red-legged Foam grasshopper, often with short black wings that do not cover the abdomen and the green, yellow and black “Bosstinksprinkaan”. 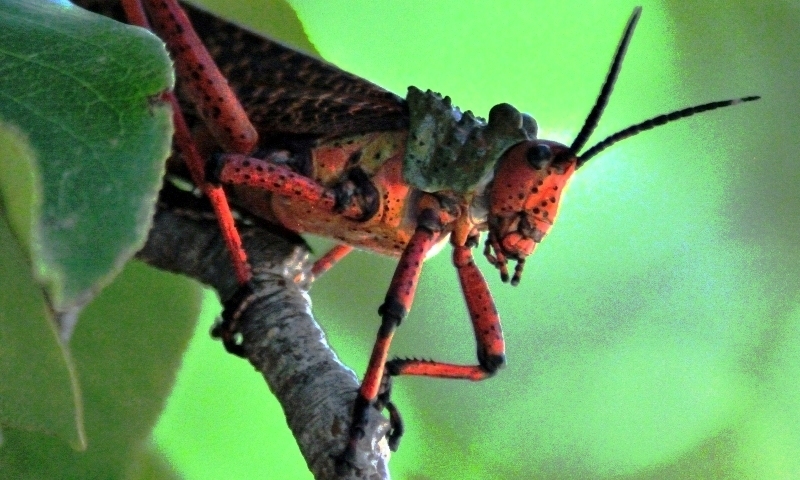 Classified in the same order as grasshoppers, are crickets. The common house- or garden cricket, most noticeable by the tireless singing chirp of the males waiting outside their burrows for a female to come by, is omnivorous. They usually feed at night on plants, selecting the tastiest seedlings to the annoyance of many gardeners. 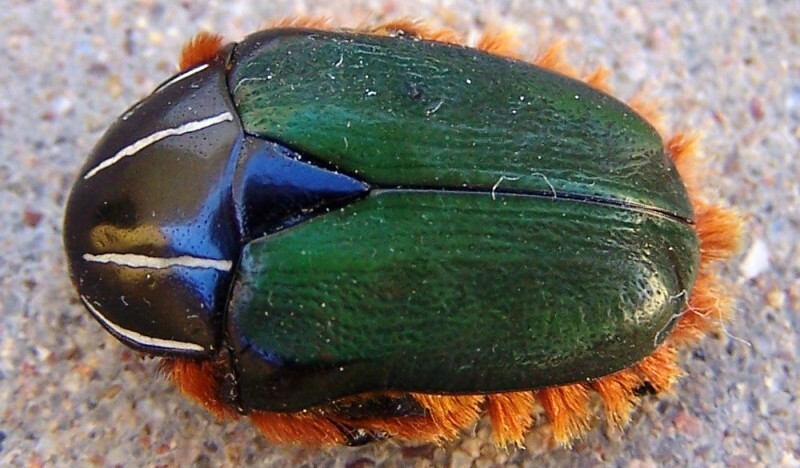 Beetles are the biggest order of insects with about 300.000 species. The Witteberg has its fair share, the most common being the so-called “Toktokkie”. They are stout globular insects with long thin legs, often seen moving remarkably fast across a road. Feeding on dead plant- and animal material, there are a number of different species of beetles to be seen in the reserve. The most ferocious and voracious of all beetles, the Tiger beetle, lives up to its common name with its prominent eyes, long legs, strong mandibles and predatory manner. 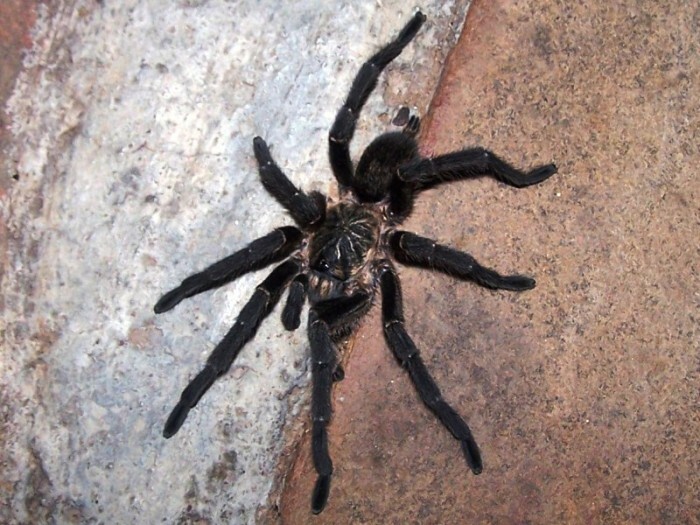 The species commonly seen here can be identified by its black colour with two patches of yellow on the upper thorax. Ant lions are evident by their familiar pit traps and trails in soft, dry, sandy soil. Both the larvae, which live under the pit traps, and the adults which fly around in the evenings and at night with their superficial similarity to dragonflies, are highly predatory. However, some adults also feed on pollen. Some of the ant lions seen here have conspicuous club-tipped antennae and usually hold their wings roof-like over their bodies during the day when they rest in the shade. Damsels and dragonflies are some of the most incredible and beautiful insects in the world. With stupendous powers of flight, enormous eyes and specially adapted forward-projecting basket-like legs, they are one of nature’s foremost predators. They most often feed on the wing. The larvae are aquatic, feeding on other water insects, tadpoles and even small fish. The well-known musical cicadas or “Sonbesies” are very shy and seldom seen, unless one tracks them by following the distinctive sound of the adult males’ songs. The nymphs complete their 2-3 year underground development by feeding on roots. Many species of ants, wasps and bees are found here. The most prolific are numerous species of ants, all of which feed on animal or plant material – either living or dead – giving them a fairly wide dietary choice. Ants are usually first noticed due to their practise of foraging in column-like parties. Apart from the Cape honeybee and the yellow-banded African bee, both social bee species, numerous species of solitary (sub-social) carpenter bees or “Houtkapperbye” are seen here. Carpenter bees, often erroneously called “bumblebees”, are conspicuously coloured, mostly black with bands of yellow or white hairs. They make their nests in spring by boring into wood, usually the dead, dry branches of trees. 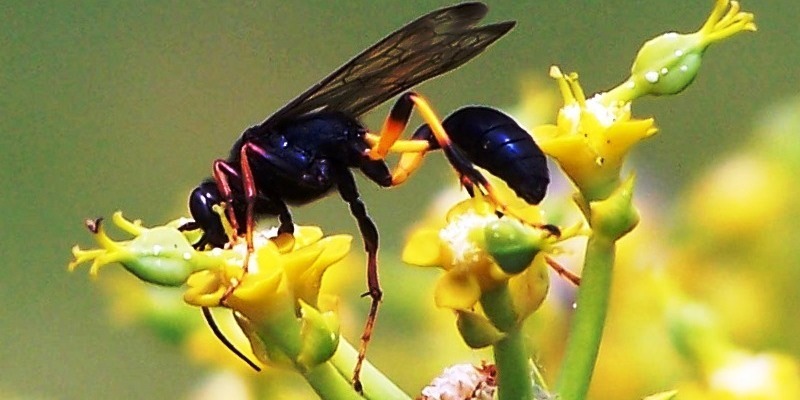 Although carpenter bees are large and strong looking, their sting is nowhere as painful as that of the honeybee. As their sting is not barbed, it is not left behind in the wound as is the case with honeybees. Another species from the same family as the Carpenter bee is a large (14 mm) black bee, which can often be seen collecting pollen and nectar and making nests in dry flower stalks. Another common member from the ants, bees and wasps Order found here is the ground-nesting ‘Sphecid’ wasp or “Graafwespe”. These wasps are large (30+ mm), black to metallic blue in colour and extremely predatory. 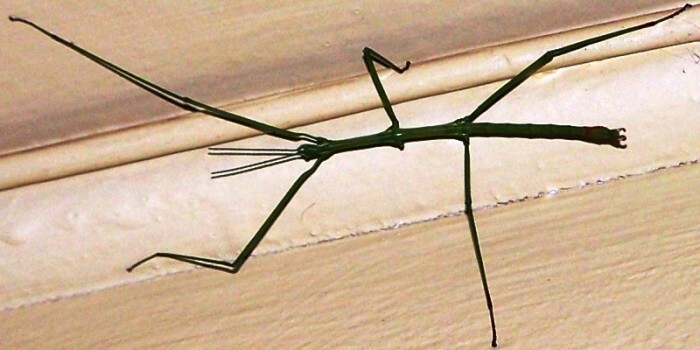 They feed on grasshoppers, crickets, cicadas, beetles, flies, ants, bees, spiders and various larvae.